Information: The size of the tags is crucial for their detection in Pix4Dtagger. Their size is proportional to the distance between the camera and the area to be modeled. For more information, see the section about tags below. Information: Camera rigs are not supported by Pix4Dtagger (e.g. Sequoia, Airinov multiSPEC 4C, etc...). However, Pix4Dtagger can create outputs compatible with Pix4D Desktop if only RGB images acquired with Sequoia are used. At the moment, Pix4Dtagger supports only the tags of the library Chilitags. Click the Download pre-rendered tags button in Pix4Dtagger to download the tags. These visual markers are square tags with a black border around the data matrix which encodes their ID and an external white border. Each tag has a unique ID and should be used only once in a project. Have a unique ID. Do not use the same tag twice in a project. Have a white border which is at least as wide as the black border. Must not be occluded by another object or the environment. Have a recommended size of about 50x50 to 100x100 pixels in the images. Practically, if the distance to the tag is of about 10 meters, the tag can safely be printed on an A4 size sheet. If the distance is of about 50 meters and a camera such as a GoPro is used, then the GSD would be of about 1cm and the printing size is recommended to be 1x1m. Flying with a Canon Ixus at 100m distance would require a 1.5x1.5m surface. The size at which the tags should be printed depends on the camera, lens and image quality. Tip: If the same tags are going to be used for several missions, printing them on cardboard instead of paper might be preferable. It is recommended to print the tags on non-reflective material. The tags should not be mirrored before printing. Pix4Dtagger is able to identify the numbers of each corner (defined by the original position) even if the tag is oriented differently when captured in an image. Image directory: The path leading to the folder containing the images that should be tagged. Line 1 identifies tag no. 20, corner 0, x=0.926565854516788, y=-0.898686213119904, z=2.0019203482441. Line 1 identifies tag no. 117, corner 0, x=0.0644895517734592, y=-0.155701025717433, z=2.00067879413364. ID being the number written on the downloaded tag files. ID being the number written on the downloaded tag files with the "tag_" prefix". corner being the corner number of the tag (0,1,2,3). x, y and z being the coordinates of the corner of that particular tag, measured on the field (with a scanner, a total station, a geodesic GPS or a previous reconstruction). If several tags are identified, each should be written on a separate line. 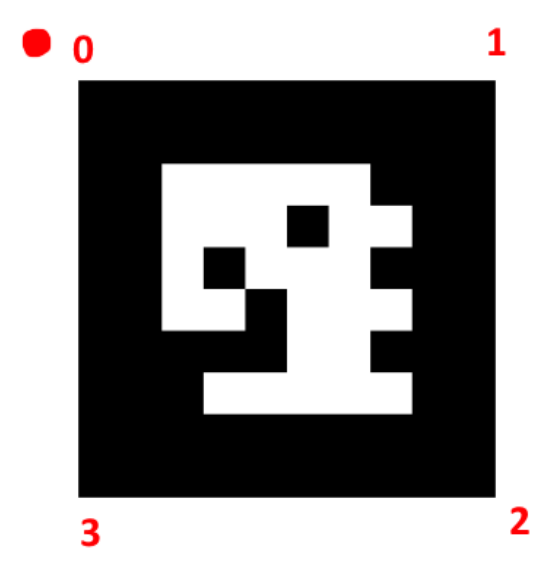 Note: It is possible to only define the tag_ID_corner without coordinates for each point. This can help improve the accuracy of the marks because it can avoid false positive marks, i.e. points that were marked but that should not have been. Note: If a coordinate file is not provided, the utility will generate the manual tie points that correspond to the corner with the red dot in each tag. The Pix4D Desktop project file (.p4d) will be created with an arbitrary coordinate system. Note that the manual tie points can be converted later on to GCPs with coordinates in Pix4D Desktop, and the coordinate system can also be modified. Text file (.csv, .txt): File with marks that can be imported to Pix4D Desktop in Project > GCP/MTP Manager. Bingo file (.txt): File with marks that can be imported to Pix4D Desktop in Project > GCP/MTP Manager. Pix4D project file (.p4d): Creates a .p4d file that includes the GCPs or MTPs that can be opened with Pix4D Desktop. Note that if files are provided for Tags coordinates file and Camera models file (v19), it is possible to export an initial estimate of image geolocation and orientation. The latter is most useful when no GPS information or low accuracy GPS information is available. At the bottom of Pix4Dtagger, a status bar displays the state of the tagging once it was started (error message, or percentage of the process completed). Dispatch the tags in the area of your project. Acquire images of your area. Make sure that each tag is visible in several images. Create a directory and store the images inside. (optional) Next to Tags coordinates file, click Browse... and select a .csv file where the tags that were used in the project and their corners are stored. Next to Output file, click Browse... and select the name of the output file and where it should be stored. Select the Format (Text file, Bingo file, p4d file). If Text file is selected, the Delimiter can be selected (Comma, Semicolon, Tab, Space). Click Start to run the automatic tagging, which will create the selected output format. Measure some corners of the tags (using a scanner, a total station, a geodesic GPS or a previous 3D reconstruction). Write the measurements into a .csv file. Acquire the images. Make sure that each tag is visible in several images. Create a directory and store the images inside. Next to Image Directory, click Browse... and select the directory where the images were stored. Next to Tags coordinates file, click Browse... and select the file defined in step 3). The way to use the outputs created by Pix4Dtagger depends on the output format. The project has the Tie Points (MTPs or GCPs) directly imported and marked in the images. If a text file or Bingo file was generated. 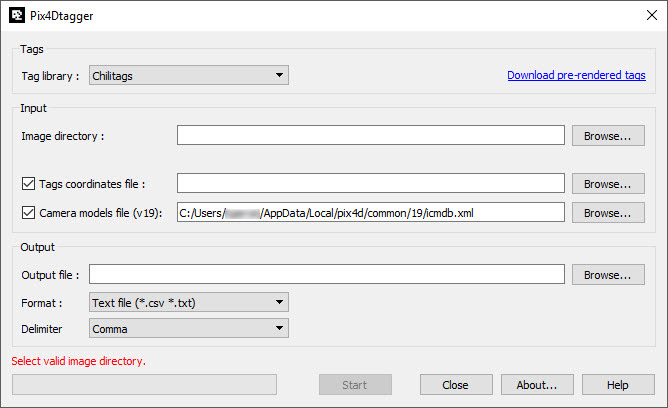 Select the .txt or .csv file that was created by Pix4Dtagger.